30/3/13 - Exhibition - London, National Gallery - Like the Louvre, the National Gallery in London is taking an interest in American art, long overlooked in Europe. After showing George Bellows in 2011, it is now displaying oil sketches by Federic Edwin Church, in collaboration with the Terra Foundation, with a reduced selection (a bit less than thirty works assembled in one room). We are thus invited to discover an unfamiliar aspect of the work of this painter, best known for his large landscapes. The exhibition is accompanied by an excellent catalogue. We have already mentioned the Hudson River School here several times, a landscape school active in the second half of the 19th century on the East Coast in the United States. Church was, along with his master Thomas Cole, one of its leading figures. This artistic current manifests itself in the grandiose character of the paintings, representing the immense natural spaces in North America, often in canvases of equally monumental size. American artists traveled extensively and these works, despite their real originality, reflect the influence of European painting. German Romanticism, notably that of Friedrich and the manner in which he represented man’s humility in the face of nature, can be found in some of Church’s works, achieving, even in these small formats, the monumental majesty of the New World. A particularly characteristic work, belonging to the Terra Foundation, shows a sailboat passing by an iceberg, offering a contrast between the frailty of the first and the gigantic mass of the second (ill. 1). This was produced from memory after a trip to the far North in 1859 where he observed such scenes. The United States and its grandiose natural phenomena were obviously a source of inspiration for painters at the time. 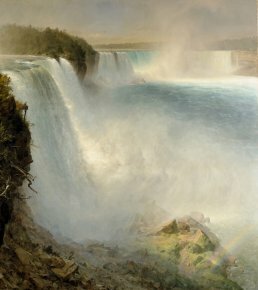 The exhibition also shows oil studies representing Niagara Falls, one of which is executed on a photograph. It is preparatory for a large painting, the only one displayed in the exhibition, on loan from the National Gallery of Scotland (ill. 2). Among the many representations of landscapes and cloudy skies, the most striking work in this hang is almost Symbolist though it is dated earlier (1861, at the beginning of the American Civil War). The reddening sky, the dead tree trunk, the skies and the clouds form an American flag. A gripping image which the painter reproduced several times by enhancing a chromolithograph with oil. This work alone qualifies Church as a major artist. The exhibition : Through American Eyes : Frederic Church and the Landscape Oil Sketch is showing at the National Gallery in London from 6 February to 28 April 2013. It will travel to the National Gallery of Scotland from 11 May to 8 September 2013. Andrew Wilton, Katherine Bourguignon, Christopher Ripolle, Frederic Church and the Landscape Oil Sketch, National Gallery London/Yale University Press, 2013, 72 p., 9.99£. ISBN : 9781857095500. Visitor information : The National Gallery, Trafalgar Square, London WC2N 5DN. Tel : +44 (0) 20 7747 2885. Open every day from 10 am to 6 pm, Friday until 9 pm. Free admission.